Help me, I'm blogging and I can't get up!!! There should be one of those alarm buttons you can wear around your neck for newly addicted bloggers. All from sitting at this @#$ computer for hours on end. Amy Chalmers at Maison Decor has the same problem. That only seems fair, since she has done nothing but encourage my new obsessive behavior. Being very clever, I hauled the damn contraption out to my terrace by my pool. Eat your heart out, all you guys stuck up in the cold!!! I AM A SNOW BIRD AND I ROCK!!!!! Here's a picture of my cool green laptop by my cool blue pool. 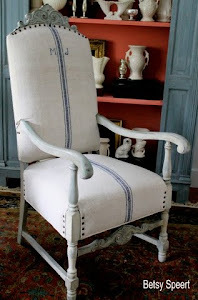 The cushion on my chaise is going to be one of my projects this winter. Right now I have one cheapo piled on another cheapo 'cuz I have absolutely no padding on my tush, and it was getting BRUISED!!! Sooooo..... I am going to make one out of the same fabric I used in my outdoor cabana curtains. Only, this one will be REALLY thick. If you guys are patient, I will be sharing pictures, as this is just something else I'm blathering on about, without showing you any images. Today is the day you get to post your questions. I want to remind you to enter my digital scrapbook give away. Click on the link to go to the page for entering, and FOLLOW THE DIRECTIONS!!! THIS IS A WORK IN PROGRESS, PEOPLE! Now for the linky party!!!!! This is the third one!!!!! 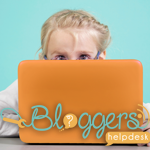 Please.....join this blog if you want some @#$ free advice!!! 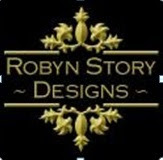 If you enjoy my tirades and pearls of wisdom, join my @#$ blog!!! BUT, I want to be as cool as she is. Please link up your intended post and not just your blog home page. Please put a link or my party button in your post so others can find it and join in. The button is on my sidebar. Ask decorating questions in the comments area below, this is for decorating questions ONLY!!! If you have a blog with corresponding pictures, link to that post. If you don't have a blog, and don't have pictures, leave your question in the comment section at the bottom of this post. 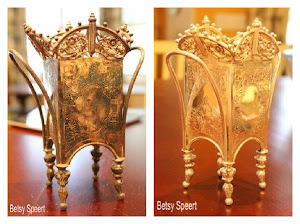 If you don't have a blog, but DO have pictures, email me the question with the pictures, to: betsyspeert@gmail.com. "you are next, click here to enter"? Well then, go ahead and CLICK ALREADY! My linky is number 1. We are in the midst of a quasi-kitchen-makeover. We will not be knocking down walls, re-doing any electrical/lighting, nor replacing any cabinets at this time. But we are dying for some color recommendations. The room is a cave (2 small north facing windows), and it's many different shades of wood. We are having to paint over the wallpaper because I tried to remove some, and the plaster came with it. We have already painted a portion of the walls with white primer. 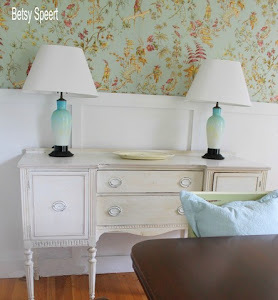 I like the idea of doing at least two colors (one on the wallpaper, one on the paneling), but I don't want anything too soft or boring...unless you tell me I should just do white and be happy about it since this room is just too dark to handle anything else. 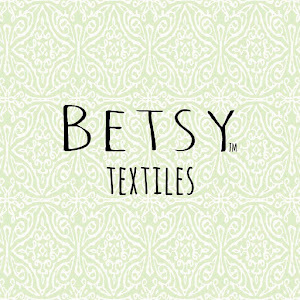 Hi Betsy~ I do have Bloggers Back!! Ouch! Hubby got me a special support for my leopard chair in my office so I can continue fighting the good fight! I will be back with a question about how to decorate a piano!!! My piano in the living room~first I have to find a post showing it, then I want to ask what you would do on or around the area of the piano so it doesn't feel like it is off in a different zone. You ARE cool!! ANd you will have tons more followers than me quicker than you can imagine, sadly. So thank you again for my book..I am really enjoying it. Betsy...I love you! We don't have to tell my husband do we? I have loads of questions but they can wait for another time when I'm more prepared. Can't wait to hear your advice to others!!! And fair warning...I will be back with some doozies that need your expert @#4 advice...soon. You are way too funny!....Love your green wicker chair..My sunroom/keeping room has the same color green wicker..It is my way of keeping a little "Florida" in my N.C. home...I am so envious of you being able to sit in your patio during the winter months..So serene..can't wait to see what you will do with the cushions...Thanks again for your input in answering my window treatment dilemma. 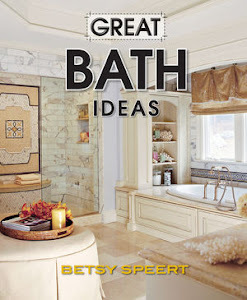 Never thought in a million years that I would be getting personal decorating advice from the great Betsy Speert. Hey I just joined your blog via email. Will you be injecting your answers for questions here in your comment section ( which is great then can read others answers) or will it be by you sending email back to them? 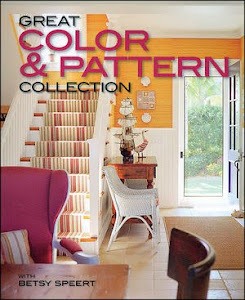 Also I know shades of Oranges are in for 2012 what are the other top colors? Thanks for answering questions. I wouldn't know where to go to ask anyone else. We will be moving in the next two years and I am getting this house ready to sell. In the master bath we have a 5 ft. counter with one sink on one end but plumbing for a second on the other end. I would rather have the counter space. Should we install the second sink or leave that for new owners? I know people like two sinks but for the life of me I don't know why. I love New England, but I have to admit, that picture of your pool makes me wish I was in Florida today! I joined in on your Linky party, looking for opinions on what I should do with my ugly fireplace! Anywho, I was not able to choose the cover for my book. The publisher did that. OY!! I post the questions with the answers right here, in this wonderful, fantastic, fascinating, informative blog!!!! You have to be a follower to get an answer, so join up now!!!! I just happened upon your blog, and am following, because you are way funny! I do have a question (I have a blog, too, but do not have pictures of this dilemma). Our house was built in the mid 70's and has grasscloth on the walls of the foyer and the stairwell. Since all the wallpaper we have stripped was evidently applied to unprimed walls, I assume this grasscloth was also applied to unprimed walls. How can we get it off? Can it come off? Are there easier alternatives to getting it off? The grasscloth is extremely worn and frayed where it wraps around corners and in other areas -- so I'm not sure painting would help. I follow you through your RSS feed, so I thought that was enough. But I am now also following through the Friends Connect.